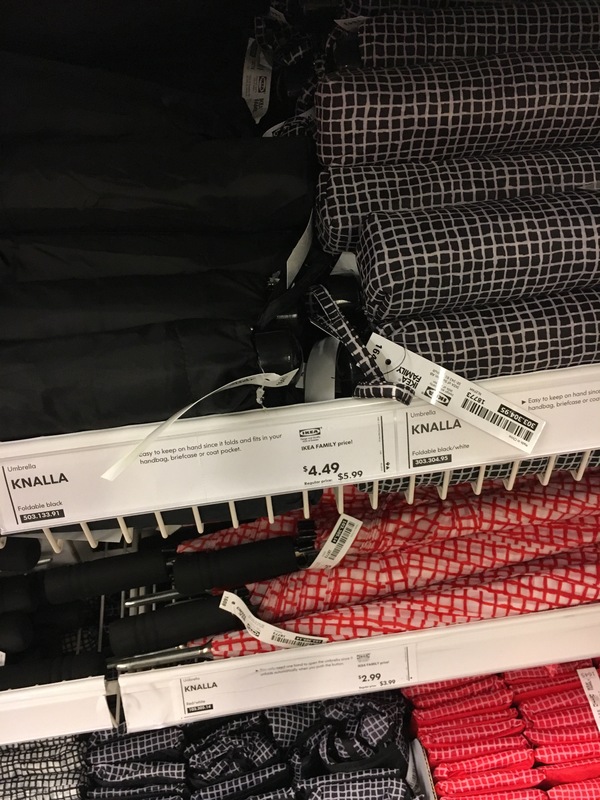 Could I create an entire ultra-light backpacking setup, all from IKEA products, for under $100? Backpack, shelter, sleeping-system… and as much of the extras as possible… maybe not shoes, but… maybe! Jardine argued that the hiking and backpacking experience is greatly improved by minimizing pack-weight via streamlined gear. Since this breaks the norm of the equipment available at sporting good stores, he began creating his own, sewing simple tarp shelters, backpacks, and homemade sleeping bags and quilts. Nifty. 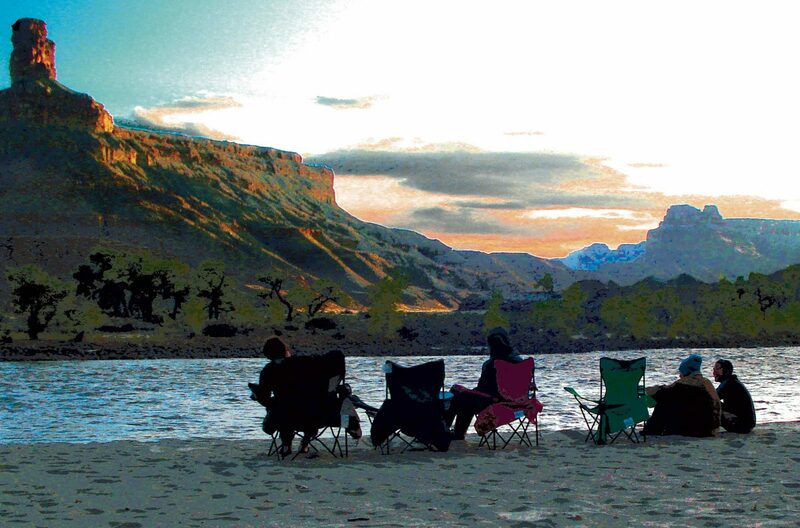 Similarly, Mike Clelland is a career NOLS instructor (and illustrator!) who has also adopted the ultralight approach and embraced the philosophy of being comfortable and happy while you’re hiking (light-pack, lightweight-shoes, lighthearted-miles!) rather than being overly comfortable in camp. 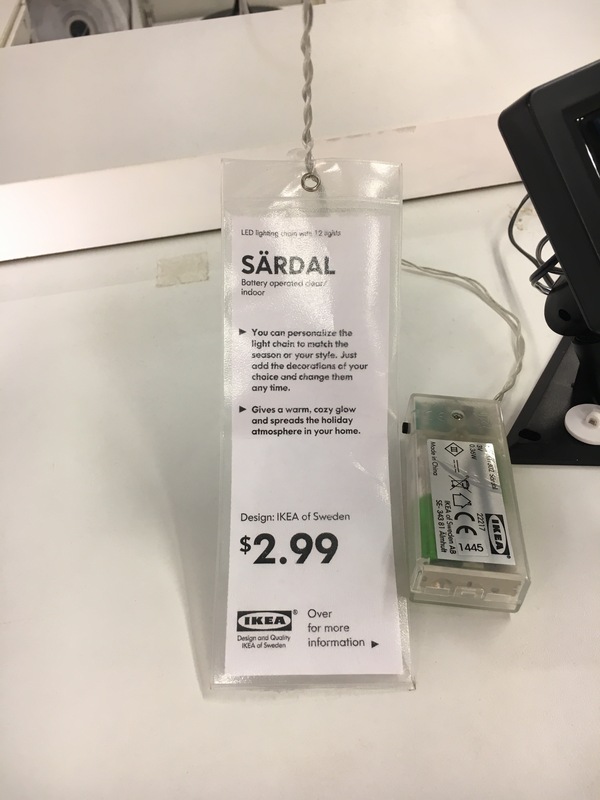 The DIY spirit of Clelland’s Tips perhaps inspired me to follow through on my silly IKEA notion. 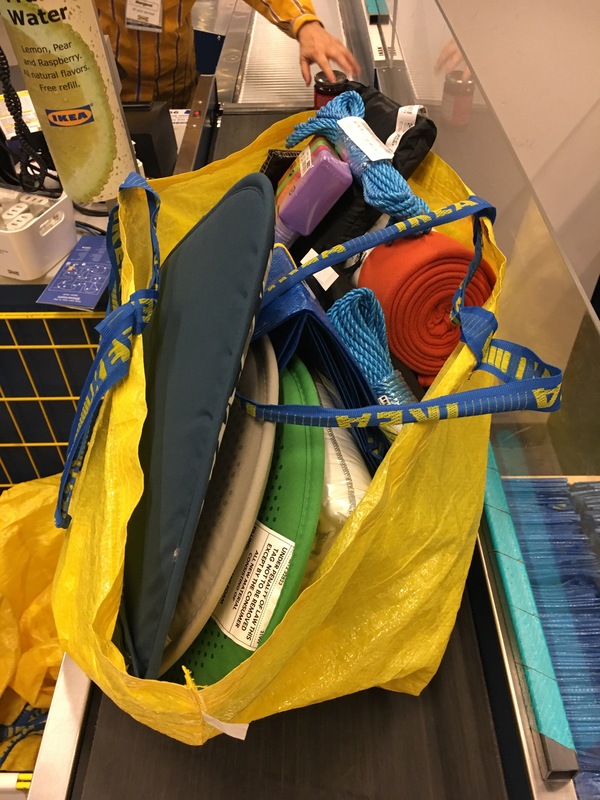 After all, if a career NOLSie uses a grocery sack full of inflated ziplock bags as a pillow… and a cat food can as his stove… what treasures might I put to use from IKEA’s vast wares? 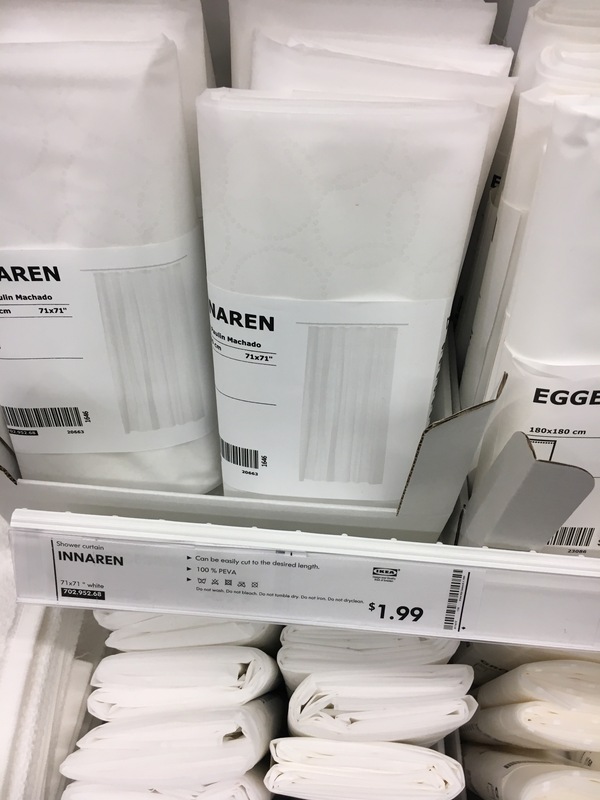 *Actually, I’m remembering now that the actual genesis of the $100 thru-hike idea was seeing a new trash/laundry-hauling bag in an IKEA catalogue that looked suspiciously like a fully functional backpacking backpack… but cost only $25, compared to around $250+ for most retail ultralight packs of the time. But when I saw the bag in the store, I realized that it’s heavy waterproof fabric made it too-heavy, perhaps, for an ultralight approach (just like my top-of-the-line, waterproof Arcteryx pack from trailbuilding days… nearly 10 lbs empty!) 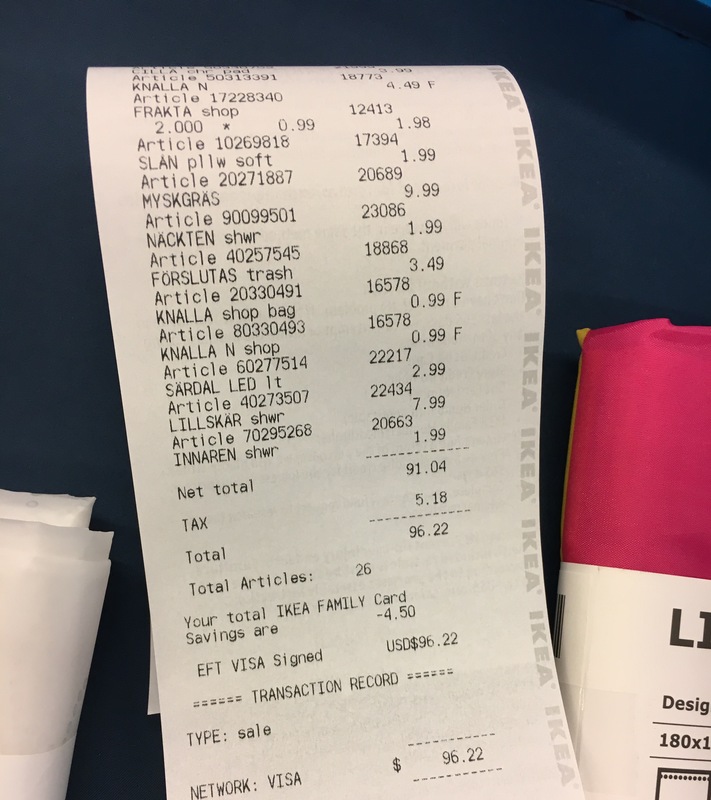 Plus, it was still a little expensive. What about just modifying a couple of the iconic blue 50 cent mega-totes into a backpack?! From the backpack, the idea expanded. Maybe I could turn a cheap comforter into a sleeping bag? 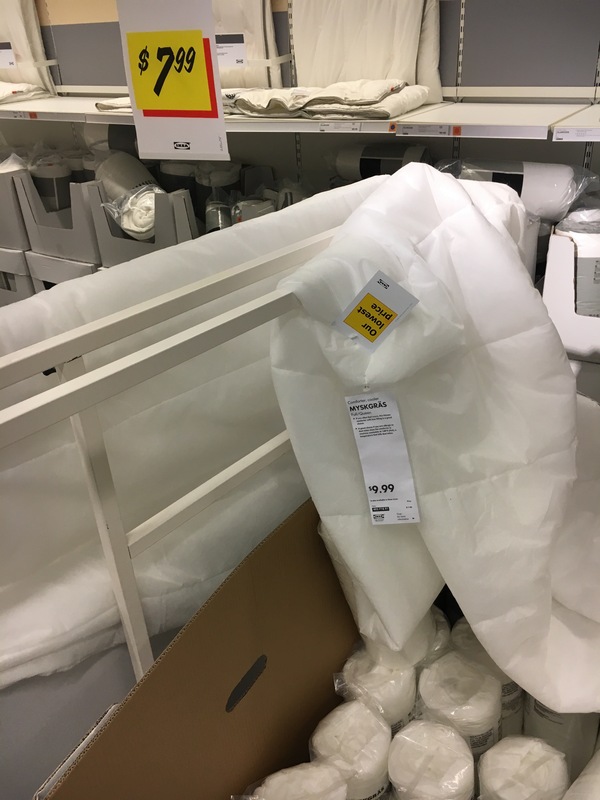 A shower curtain into a tarp? What else? 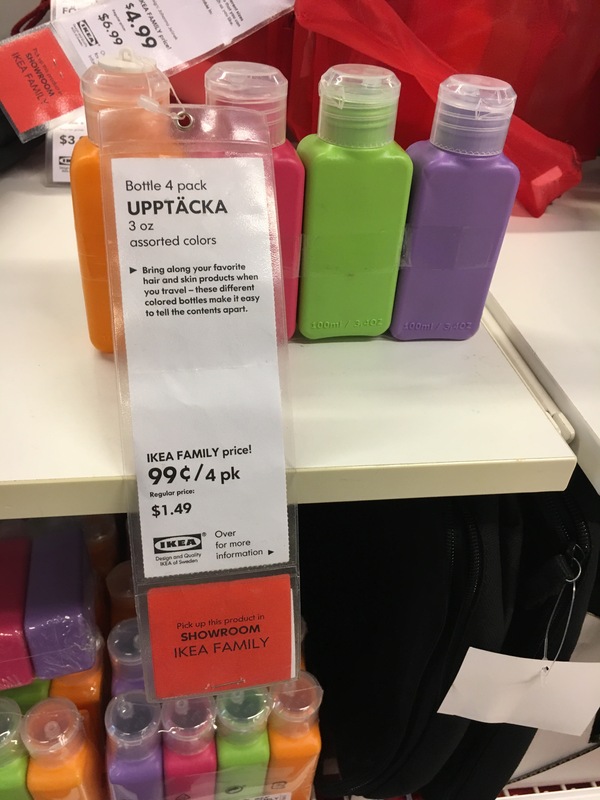 Finally, the other day I dropped into IKEA to, I don’t know, to just wander around and maybe have lunch? But quickly, I found myself in a rush of excitement gathering my supplies. Sleeping bag guts: cheapest comforter option, light-weight synthetic… barely any insulation. 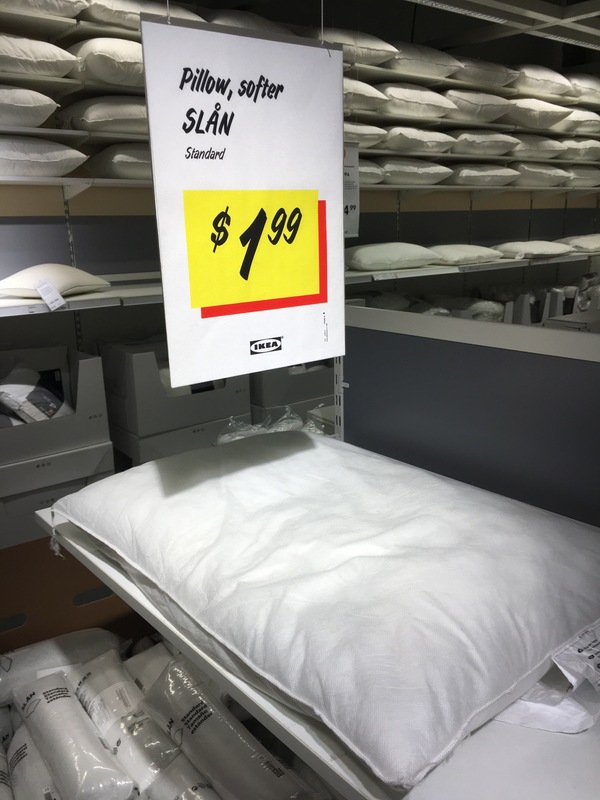 What could I do with a $2 pillow? 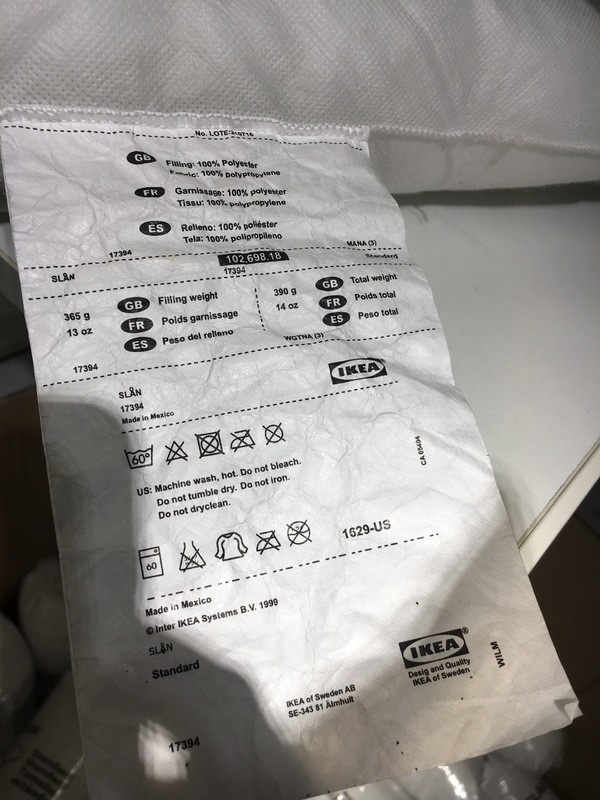 100% polyester filling… maybe I’ll use the pillow guts as extra fluffing for the sleeping bag. 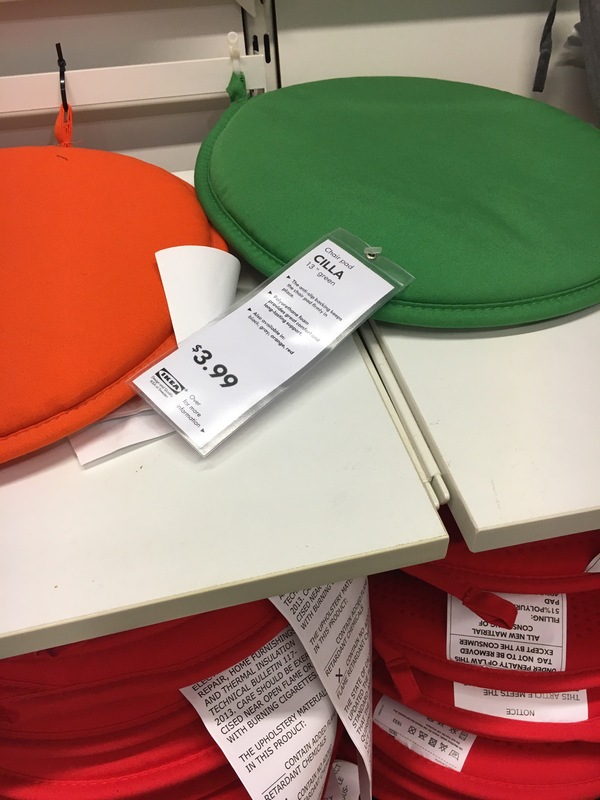 $4 seat cushion… spendy! But for a key element… sleeping pad. This round pad is just big enough for my hips, while I grabbed a slightly rectangular pad for my shoulders. 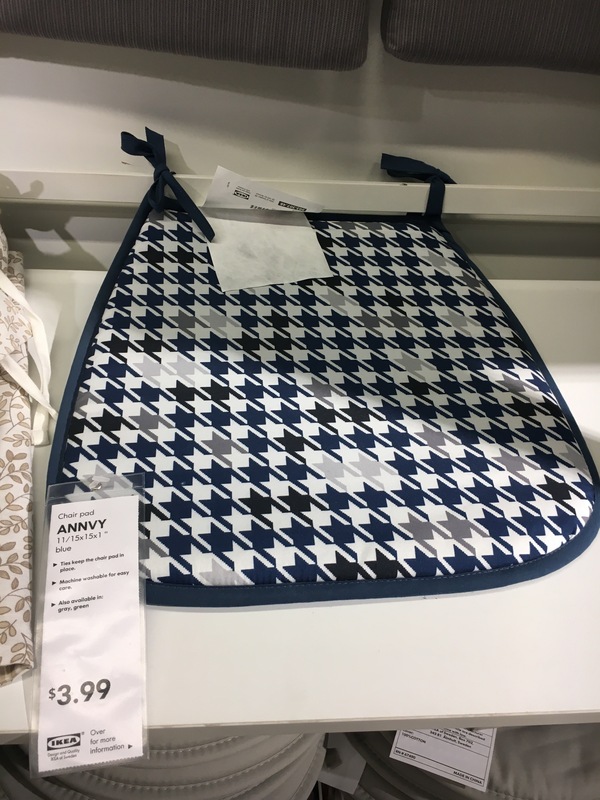 Just wide enough for shoulders, feels comfyish, at least on IKEA’s floor. Opaque waterproof shower liner. Possible shelter?! 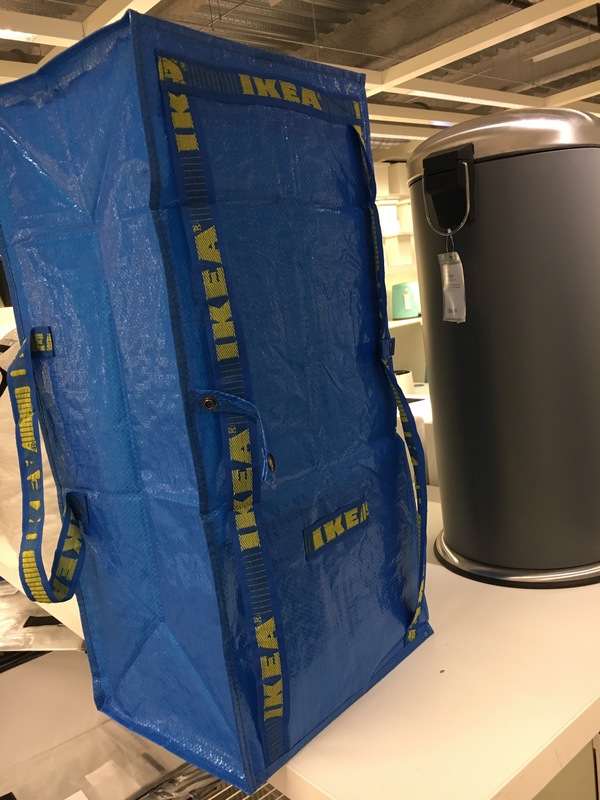 Definitely lighter than a heavy IKEA tarp… but is it long enough and durable enough? 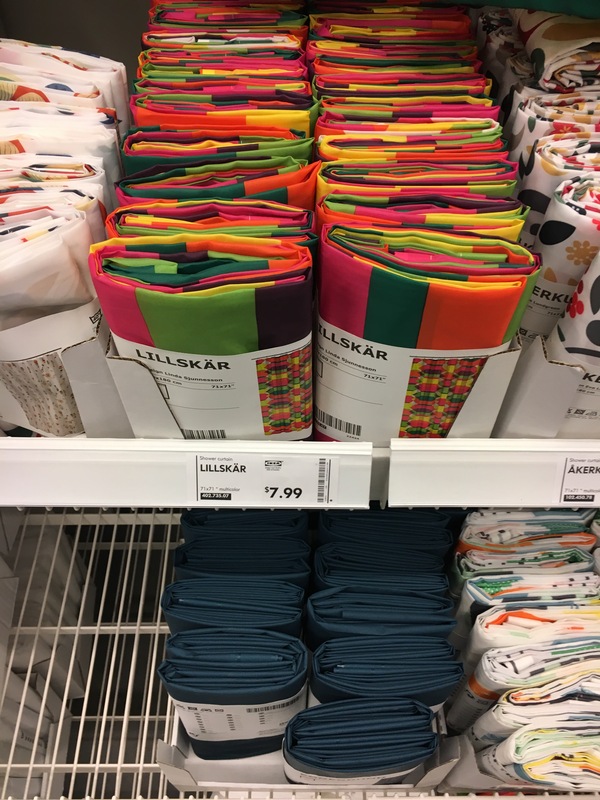 Colorful outer shower curtain (breathable) for sleeping bag exterior fabric. This bag is ready for backpacking off-the-shelf! I didn’t even know they made this zipper-closing backpack variation on the standard mega-tote! I have my doubts, but how cool would it be to use an unmodified $2.00 bag instead having to learn to sew a few of the standard ones together? An indulgence… instead of a headlamp with 2 or 3 LED bulbs… I’ll use this battery-powered strand of 12 LEDS to keep my shelter cozy. To the right you can see the side of the solar-powered version, which I spent some time pondering. Could I hack that little solar panel to power my phone or a phone battery deal? MAYBE. But heavy. And more expensive. Under $100 WITH a bag of frozen meatballs and pack of gravy to take home to the family. And a little hand-broomy thingy I’ve long wanted to clean up our coffee station at home. There it is! My ultralight backpack setup! Well… some assembly required 😂👏👏.